Remember that time Teri and I went to a wine class and tweeted about the fascinating things we were learning, and promised a longer in depth post? The class was offered by a local wine store/restaurant called Vin 205 Bar at Wine Merchants. I’ve shopped there for wine a number of times, and I’ve always found them to be super helpful with recommendations. The class was called “Polar Opposites” and the intent was to talk about why two wines of the same grape can taste so different. Have you ever had that happen? For instance, you become familiar with a certain type of grape and order a glass of wine in a restaurant…only to find out it tastes nothing like you expected. So we were going to learn why things like the way the wine is aged, fermented or blended or even the different climates of where certain grapes are grown can affect taste. 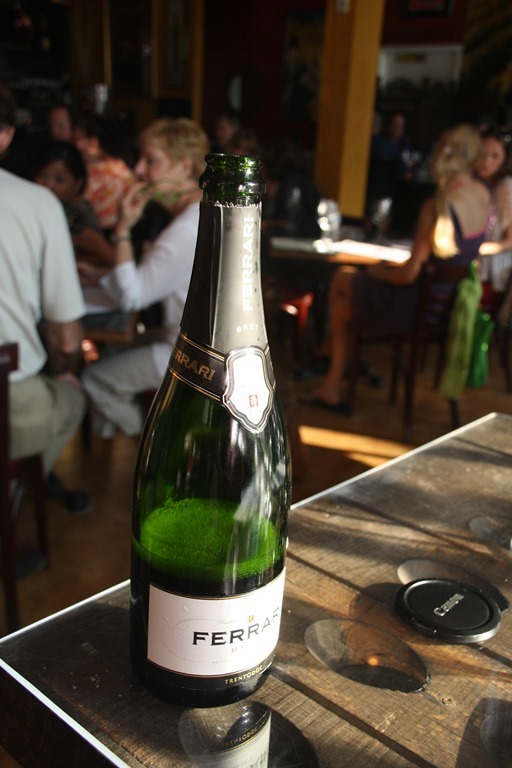 – First, we tried the Ferrari NV Brut from Italy ($29.99) which had gone through the “traditional” method of secondary fermentation in the bottle. This is more labor intensive and time consuming, but it produces bubbles that are more long-lasting and elegant. This wine was loooovely. I could have had many a sips of it. 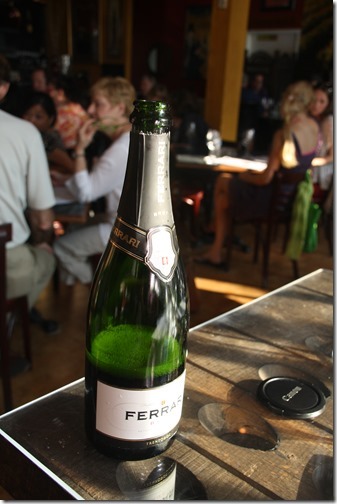 – We compared it to the Pascual Toso NV Brut ($10.99), another sparkling Chardonnay from Italy, done in what is now a more common method with secondary fermentation happening in large batches in stainless steel tank. This method allows us to have our sparklings at more affordable prices, and the resulting bubbles are more intense but they dissipate quickly. This wine didn’t disappoint, and I would have been happy to toast good news with either one but the difference was obvious when the two were compared side by side. – The Iron Horse 2011 Estate Chardonnay ($29.99) aged in 100% french oak was – as would be expected – spicy, vanilla-y and oaky. I liked it a lot – I felt like the oak was a nice presence, not overdone. 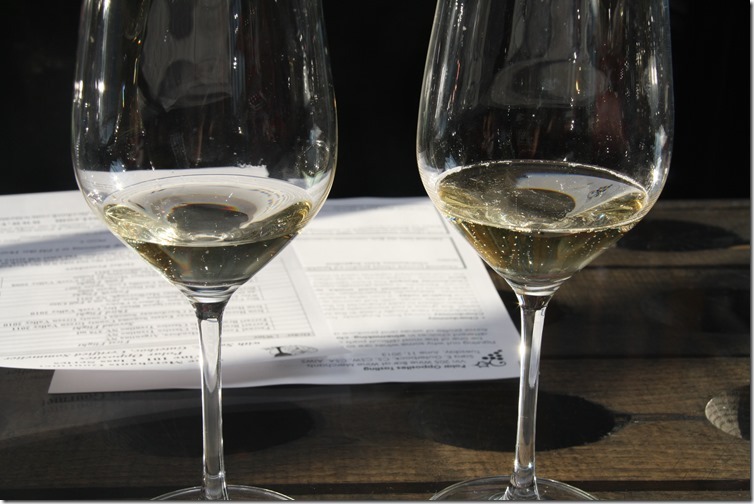 – We compared it to another Chardonnay from the same vineyard, the Iron Horse 2010 Unoaked Chardonnay ($25.99). This one had a similar spice, but I noticed more fruit flavors and of course, no vanilla or oak. I think a lot of people who don’t love Chards because of the oak would be surprised how much they might like a stainless steel or “unoaked” Chardonnay. Definitely a good thing to look for on a wine list to try sometime. Teri actually spied this bottle on woot! a few days after our class and we were able to nab ourselves a bottle at $20 a piece. We were pretty psyched about that find. Sauvignon Blanc: Do I detect a note of cat pee? – The cooler, new world Dry Creek Vineyards 2010 Sauvignon Blanc ($14.99) was one of those I would have ordered in a restaurant and been a little disappointed by. It was by all means a “good wine” (high rating) but it lacked the floral or herbaceous notes I’m usually looking for when I ordered a SB. – Also from a cool climate new world was the Drylands 2011 Sauvignon Blanc ($17.99) which I liked a lot – it had a very floral bouquet on the nose, a little bit of a peachy taste but definitely wasn’t sweet. It’s one I’d like to seek out again. It was from New Zealand and the first SB was from California. – This is the grape that we usually think of when we think of Spanish reds. It’s sometimes bottled alone or else it’s blended with other red varietals to make the Spanish Rioja wine. In this case, we were comparing the difference between a predominately American oak aging vs. a French oak aging. To be honest, I couldn’t detect a sharp contrast between the two other than that I liked both of them and I’m not totally sure how one would know the type of oak used from a quick glance on the bottle, so for my purposes – learning more about how to choose wine – I didn’t get a lot out of this particular lesson. Except, of course, two yummy glasses of wine. 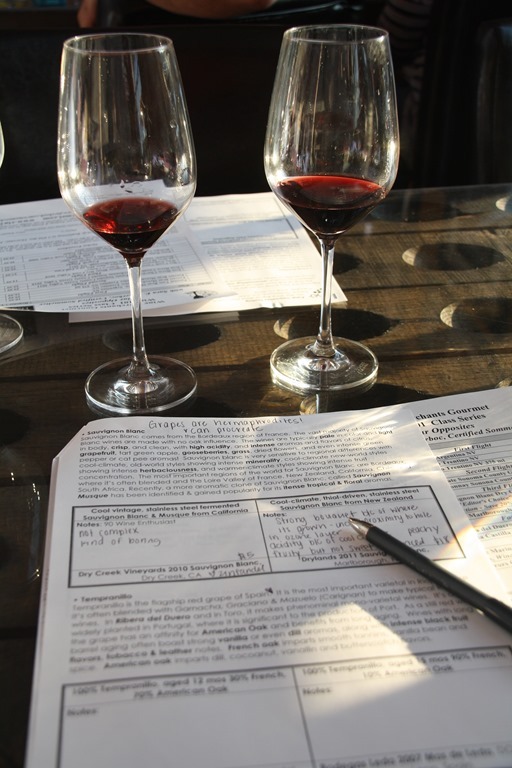 – I wrote down that the Pena Roble 2006 Crianza ($25.99) was spicy, smooth and had hints of blackberries and nutmeg. It was aged in a predominately American oak barrel. The Bodegas Leda 2007 Mas de Leda ($19.99) was aged in a primarily French barrel and I described it as cherry with hints of vanilla, a little bit tobacco-y and brighter flavor than the Pena Roble. – The Dry Creek Vineyards 2008 “The Mariner” Meritage ($45.99) was a blend of cabernet sauvignon, merlot, petit verdot, malbec and cabernet franc. It seemed like the winemaker just poured a little bit of everything in, but it was pretty spectacular. It was a very dry wine, lots of tannin and had hints of cocoa and tobacco. If I was picking a red that it reminded me most, I’d say the Cab Sauv but it’s hard to pinpoint for sure. – The last one was one of my favorites of the night. The J.C. Cellars 2011 “Smoke and Mirrors” Red ($29.99) was a blend of Zinfandel, Syrah, Petite Sirah and Grenache. It was smooth, it had a light mouthfeel and a definite hint of berries. It leaned heavily toward the Zinfandel (thus my preference) but it had a fun, nice complexity to it. I liked it and was pretty sad when my glass was empty. Overall, a super fun night with one of my favorite friends and we learned a lot. It’s probably a good thing I waited a few weeks (months) to post this, because giving myself some distance from the experience allowed me to edit what I wanted to share. Had I written this the day afterwards, it might have been a thesis. Obviously, I started this blog to give myself a thinly veiled excuse to drink a lot of wine but deep down, I’m a nerd at heart and I love learning about topics I’m passionate about so I can’t wait to do more classes like this. 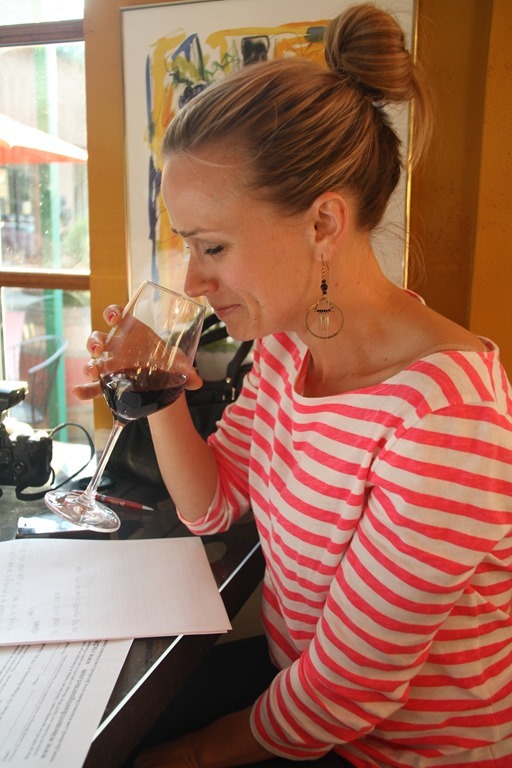 Plus, how can you complain about learning served with a glass of vino? You can’t, you simply can’t. Loved this post! Super interesting and what a fun class. Thanks Kelli! It was a fun class – glad that came across in the post! Haha… Somehow I forgot to work that tidbit into my post! !